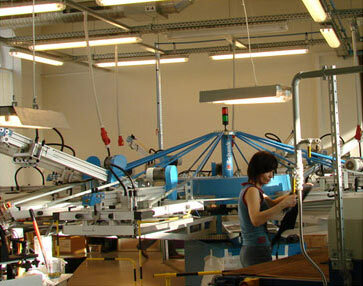 Screen printing on garments has been our main speciality since the establishment of Arolita in 2000. We have chosen and consistently developed this traditional method of printing that assures the especially good ink coverage, print resistance and long lasting colour intensity. In the very beginning we were able to offer small runs on promotional t-shirts. However, the positive feedback from clients motivated us to develop our company’s practice considering the requirements for large customised printing orders. We print panels and ready-made garments on our automatic carousel machines as well as do all the in house preparation work including getting the clients designs or drafts ready for production. Efficient printing and fixing equipment combined with extensive staff experience ensures the highest quality of services, rapid and smooth project management at competitive prices. As well as printing on fabric we can brand many other surfaces including paper, plastic, leather, wood, ceramics and glass using methods of screen printing, pad-printing, embossing, engraving etc. Equally we produce functional and easy installed parasols, tents, marquees, flags and banners for cafes, promotional and outdoor events. Here at Arolita we are extremely cautious when it comes to organic products, inks and other supplies. In 2010 we have been certified and granted permission by the Institute For Marketology (Swiss certification organisation) to perform printing work that complies with Global Organics Textile Standards (GOTS). Certificate No. 100493-LV. Products carrying company names or trademarks shown in our web-site do not necessary imply that the products have been supplied to or endorsed by the owner of the trademarks, but are meant to be representative of the effect that can be achieved by the creative personalizing of merchandise.